Integral to the Wollongong scene since the late-eighties has been the involvement of the seven Curley brothers from Tarrawanna. From Vic Vomit and the Varicose Veins, Proton Energy Pills, Tumbleweed, and Zambian Goat Herders in the late eighties and nineties, to current acts Hy-Test, BRUCE! and Bulldoze All Bowlos the Curley brothers have left an indelible stamp on local music. And whilst none of the brothers performed on this split 7" from 1990, three of them did play crucial roles in its' concept and ultimate release. Prior to moving into it's current location on the corner of Keira and Burelli Streets, Wollongong Youth Services was a transient beast. Utilising run-down council-owned buildings to deliver its essential programs, the fledgling service scraped and borrowed what it could to provide local youth with a safe, creative space. Youth Services coordinator, Proton Energy Pills vocalist, and one of the Curley brothers, Dave applied for a grant from the NSW Department of Health as part of it's Drug Offensive scheme. Dave recognised the positive effect music can have on young people and set about using the grant to run music workshops from South Beach Surf Club - the Youth Service's headquarters at the time. Dave asked younger brother and bassist for the Protons Jay come in, along with Protons guitarist Stew Cunningham, and teach the basics of music performance, gear set-up and songwriting to the participants. From those sessions formed three bands; Dri-Ice, The Beachfront Bad Boys and Eat My Chainsaw. Paul Hanes, guitarist for Eat My Chainsaw, remembers the experience fondly. "I had bought a guitar form the Wollongong Music Centre and was wanting more lessons. I spoke with my friend Hunter Montgomery who also wanted to learn guitar. So we attended music lessons [at the Youth Centre]. I couldn't have had a more patient and understanding guitar teacher in the form of Stewart Cunningham. This long haired guitar virtuoso played solos with drumsticks and could pick with his teeth. I remember laughing at all of the rock jokes he made and admiring his Maton and Epiphone with the batwing head stocks." Cunningham also recalls the fun he had. "Dave got myself and his brother Jay an afternoon job at the youth drop in centre teaching the kids how to play and jam, stuff about amps and pedals and all that. Dave and I were playing in the Protons and sharing a house near the North Gong so it was good for us to do something outside of the band, help people out. 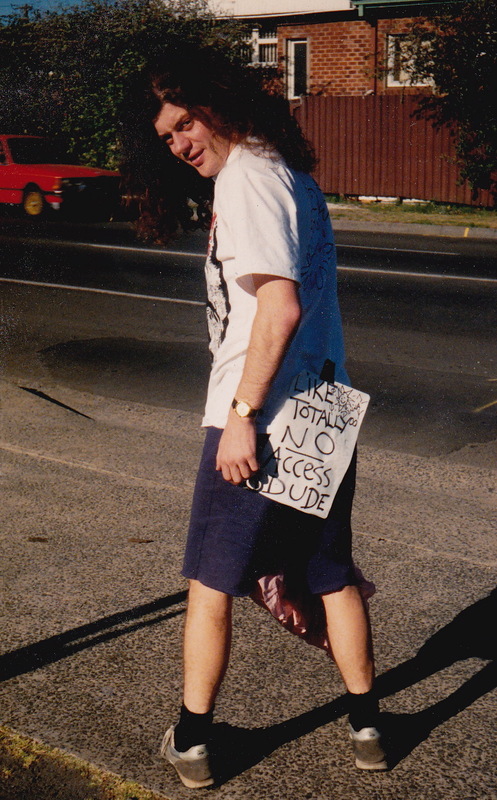 There weren't many jobs in the Gong, let alone ones for young dudes with long hair! I remember showing a few kids like Paul Hanes and his mate Hunter how to play guitar, it was all pretty good fun down there." Six months into the program the broader intentions of the program were annouced. "I applied to the NSW Dept of Health for some funding," says Dave Curley. "It was for $5000, I think. I wanted to run a drug education program with an 'edge'. I was sick of the corny stuff that was out there that was totally paternalistic and patronising to young people. The 'bag the fag' TV ad comes to mind that featured all these shiny white kids dancing around singing 'bag the fag' with anti-smoking messages being hammered down the viewers throat. It was an example of something that was obviously adult designed and driven. My idea was to have something that was young person designed and driven. I was the facilitator, not the designer. I was about 22 or 23 when the process started, and the target age for the participants was 13-17." 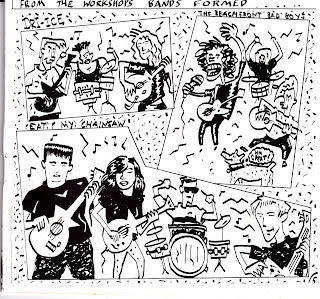 Dave's idea had grown into plans to record and release a seven-inch single using the bands that had formed from the workshops; quite cutting edge for it's time. Says Hanes: "We were learning guitar when Dave Curely told us the news that he had been successful in getting money from the Drug Offensive to record a single and a video clip. This was a 15 year old boys rock and roll dream come true and the only problem was we had never written a song before. So we put together a few riffs and the first song that me and Hunter ever wrote was recorded on single." "There was nothing like it at the time" remembers Curley. "I believe this was a catalyst for this kind of thing as today it's quite common. During the early 90's I travelled around NSW presenting it to youth services and health services as people were interested in taking an approach that engaged young people's ideas. That approach was not common then." Discussing the funders acceptance of his idea, Curley continues: "A key player was a guy named Michael Lodge from Illawarra Area Health Service (IAHS). He held the purse strings for youth health programs in the Illawarra. He was a great guy; forward thinking, progressive and willing to have a go at something controversial. I think we snuck under the radar. My boss at the time, Lois Besnard was very supportive as was the Manager of Council's Community Services Division, Ethel Lewins. They just let me run with it." As documented in the comic that accompanies the single, Dave headed overseas, and upon his return Dri Ice and The Beachfront Bad Boys had disappeared. Dave talent-spotted Social Outcasts at a gig out at Towradgi and offered them the flipside. 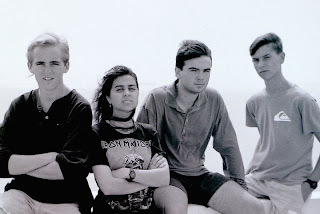 Guitarist Brad Screen remembers: "We were seen at a party at Towradgi Surf Club thrown for a girl I knew from school, and I remember Dave asking a while later 'what was I doing at an underage party to start with, to come across you guys?'. When he contacted us about the single, I remember telling him how good one of the other bands were who also played that night. I can't remember their name now but Dettol's Kane Goodwin was the drummer. They played Sunnyboys covers plus a few originals too. I'm sure I was trying to tell Dave 'they're the guys you want, they're really good'." "We didn't know back then that any Youth Centre existed or anything like that. We rehearsed in parent's garages, school halls, backs of pubs, and played at partys and the odd pub gig"
With the bands secured and the songs written, the next step was to go into the studio and lay down the tracks. Hanes remembers the studio as being "a funeral home where the morgue was converted into a studio and the show room upstairs was a BBQ's Galore. We took about 2 hours to get the song right. We then took a break before starting the lyrics and solo, whereas the Social Outcasts recorded their song in the first take. Stewart Cunningham arrived late in the day and listened to the song. He went about helping me to fix the solo up. He set up a Marshall with a tube screamer and some chorus and gave me a Stratocaster. He showed me the first three or four notes and then how to feedback the guitar into the amp. The solo on the record has a Stew signature to it and sounds a lot better than I was actually capable of in those days." "The recording was pretty quick", says Screen. "Two takes, then the first take was picked. Music by Paul, lyrics by Alan. Paul's lead break was taken from the first take too, which he made up on the spot. I'm sure the chorus was originally sung ''11.57, another junkie goes to heaven" but in the studio Alan sung "57.11...." I'm not sure if that was diliberate or what. I don't think I ever asked him about it." "We were excited about doing a recording," continues Screen. "But not just a recording; a vinyl single. That was the ultimate. CD was all around, and we all had vinyl LP's, but I know I started buying singles before albums cause they were cheaper, and we were going to be releasing one with our band. That was the ants pants man." The finished product included a comic which, conveniently for SCS readers, captures the history of the project quite nicely, along with some additional pieces by budding artists. "Bill O'Donovan drove the comic and the artwork," says Dave. "He was too modest to have his name plastered all over it. If you look close you will see 'B O D' in places. The kids did the same, there are obscure initials throughout. My brother Lenny helped me out when I needed one more page to fill the comic and he came up with Square Dog, pretty funny.That part of the project was flailing and Bill breathed life into it and made it a highlight by running comic workshops with kids and contributing some of his own stuff. Bill did a lot of artwork for various music and community projects in the 80's and early 90's before he headed off to Japan. His best known work to music people would be the Man Bites Dog record cover and many posters. In fact 'The Good Trash' name was Bill's idea, and he did the cover." Videos were shot for the songs, both of which featured on the Steel Town Sounds documentary by local film maker Grant Osborn. Both videos were aired on on Rage and Countdown Revolution, an early 90's attempt at reviving Countdown. "The video shoot was a blast", remembers Screen. "I don't know who got the word out [but] it was a decent turn out. [It was filmed] at the back of The Patch of all places. We used to practice there too. I gave my mum some money, and she helped by transporting band equipment. I'm sure there were some injuries by the end of the day. The project was a seen a success in more ways than one. "The bottom line to the Council and IAHS" says Dave "was that it won a prestigious award. They were stoked. I believe that had The Good Trash not existed I would not have got the license to run all the music programs at the Youth Centre, the jam room, the recording equipment, the PA, etc... The Good Trash made youth music programs legitimate in the eyes of Wollongong Council, so we picked it up and ran with it." "When the project won first prize in the Sydney Morning Herald Youth Awards in 1990 the Government hierarchy at Council and IAHS were stoked and were happy they let the shabbily dressed long haired youth worker do his little music thing." The participants all received Wollongong City Council Youth of the Year awards, presented by then-Lord Mayor Frank Arkell. Former Member for Cunningham Stephen Martin even mentioned the project's success in his parliamentary speech on the introduction of the The Crimes (Traffic in Narcotic Drugs and Psychotropic Substances) Bill 1990. "One of the issues that has always come out of the attack on and the fight against the spread of drugs in this country has been the effort to get down to the basic level - that is, to the people who are most influenced by those trying to peddle these substances of death and destruction. I am talking about the children, our kids. I was particularly heartened recently when in the city of Wollongong, where I live, I attended the launch of a particularly attractive method of trying to convey an anti-drugs message to young folk in our area. 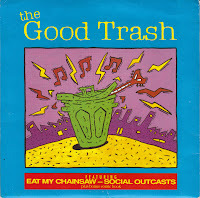 That was the launch of a record called The Good Trash. That record featured two bands. One was called Eat My Chainsaw and the other was called the Social Outcasts. 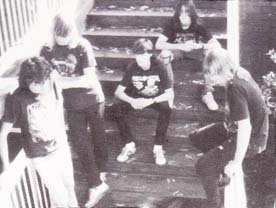 The reason that names like that were chosen by these young people - in one case most of the members of the band were still in Year 12 at Figtree High School and the others had just left school - was to try to attract attention to themselves so that [they] could push their anti-drugs message." Ironically, a number of participants in the program would later battle their own substance addictions, but for others it was a life-changing experience. Following the split of Eat My Chainsaw, Hanes joined Dinky Crash. "I was apreciative and still am of the world which Dave Curley opened up to me and the fun that it brought my life. "After The Good Trash I was on the Design Board for the Wollongong Youth Centre and worked with the youth workers and architects to ensure that there was a good youth centre with a rock and roll legacy. I went on to become a youth worker and have been in the field for 20 years now, and work in London." "I was always proud that one of The Good Trash boys made that leap," says Dave. "It made the connection between the project that started the dream to the one that completed it." Following the demise of the Protons, Dave, Jay and Lenny went on to form Tumbleweed. Whilst Jay and Lenny remained with the band, Dave soon left and joined Zambian Goat Herders. Dave still lives locally and now works as a teacher. Stewart Cunningham has held a distinguished career in music, having formed Brother Brick, as well as playing in bands such as Asteroid B612 and The Yes Men. He currently fronts Leadfinger. Bill O'Donovan teaches Fine Arts at West Wollongong TAFE. I remember these days well and the impact Dave Curley had on our musical lives. 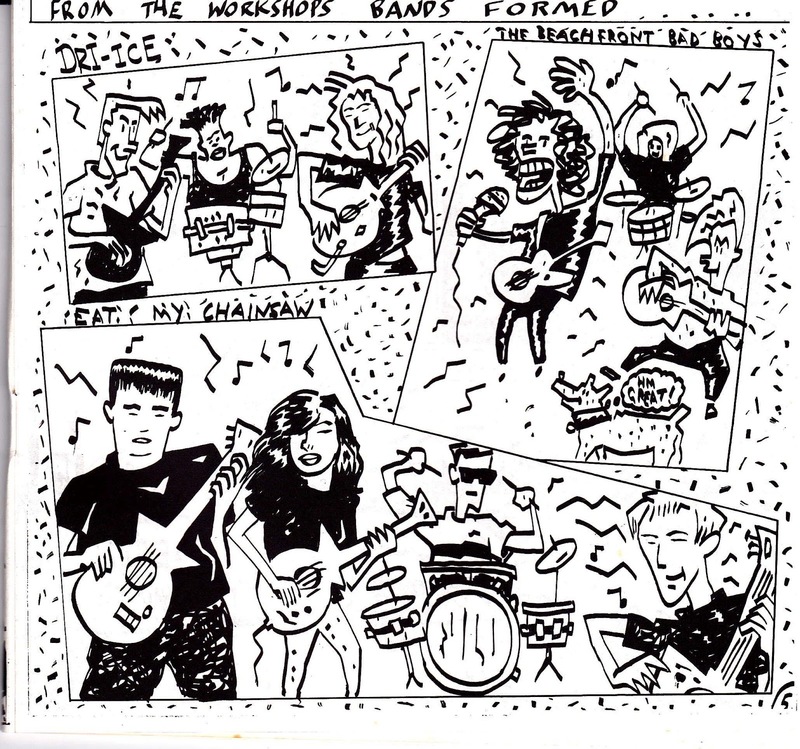 I was the guitar player and singer in Dri Ice which Dave put together at the South Beach rock shop in 1989 and we were later mentioned in the comic. Thanks to Dave, I'm still gigging 23 year on! Pictures are just like freaky.